Some call it the lung for the people in Darfur to breathe credibility, objectivity and a purposeful message. Millions of people in war-torn Darfur region in western Sudan rely on daily information about what's happening around them. They rely on Radio Dabanga - which is operating approximately 6,000 kilometers away from Sudan, in a building in the center of Amsterdam in the Netherlands. Since December 2008, Kamal Elsadig, editor-in-chief of Radio Dabanga, and his team report on what is happening in Darfur, as well as in other parts of Sudan. They get their information from the local people. Eyewitness reports you won't find elsewhere in the country's media, but which are crucial for the safety of the people on the ground. Air strikes by the Sudanese military, attacks by the infamous Arabian horse militia Janjaweed, abductions in eastern Sudan, but also cholera outbreaks, famines, severe weather warnings, impending droughts or floods - Radio Dabanga gets all the information, double-checks them thoroughly, and broadcasts them. Independent reporting is not taking place in Sudan anymore, and all press activities are monitored and potentially censored by the government in Khartoum and the ubiquitous National Intelligence and Security Service (NISS). In addition, there are hardly any reports in the international media about the Darfur conflict anymore. Maybe there are just too many and more recent trouble spots worldwide. 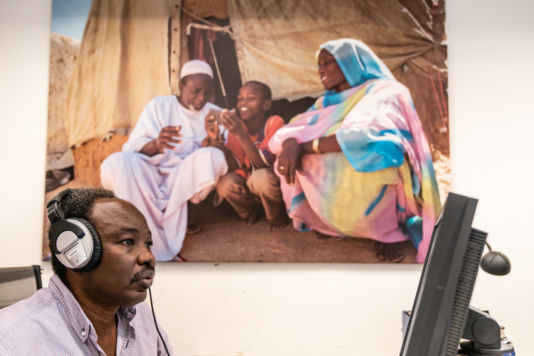 In fact, Radio Dabanga is the only media station that provides people in Darfur with independent and reliable news. The conflict in Darfur began in 2003 when the Sudan Liberation Movement (SLM) and the Justice and Equality Movement (JEM) rebel groups started fighting the government in Khartoum, accusing them of oppressing Darfur's non-Arab population. The government responded by attacks and campaigns of ethnic cleansing. As a result, a roughly estimated number of hundreds of thousands of casualties and millions of displaced people and refugees inside and outside the country. In 2009, Sudan's president Omar Al Bashir was indicted — as the first sitting president ever — for genocide, war crimes and crimes against humanity by the International Criminal Court. It was not an easy way for Kamal Elsadig, born in Darfur, to his radio station in Amsterdam. He began as a journalist for the quite prestigious and thoroughly progressive Sudanese newspaper El Ayam. He was one of the first to report violence and human rights violations in Darfur. And so it didn't take long until the editors of the newspaper got a visit from the secret service. “The message was clear: the regime did not want to see any more articles by me", Kamal recalls, "but the newspaper stood behind me, and had to pay for that with a banning order." 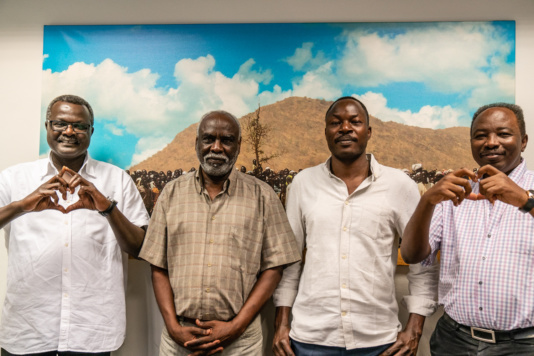 By chance, he came into contact with employees of a Dutch NGO called Free Press Unlimited, and a little later the idea was born for an independent radio station for Darfur. Kamal came to the Netherlands in 2008 and immediately started to work as editor-in-chief for Radio Dabanga. Today, up to 2.3 million listeners in Sudan tune in when Radio Dabanga goes on air twice a day. In the mornings and in the evenings, the station provides a total of one hour of Arabic language news coverage: for city dwellers, villagers and herdsman, internally displaced people, refugees, Darfuris and Sudanese abroad and in Sudan alike. Meanwhile, they have also established a television channel that is broadcast via satellite and already got about 1 million viewers daily, and more recently a Youtube channel. But the arms of the regime in Khartoum and the censors of the secret service reach far - even into outer space. On the 18th of February this year, the TV images from Radio Dabanga's TV channel suddenly went dark. The Egyptian satellite company Nilesat that Dabanga TV relied on for broadcasting its program suddenly booted the station off without prior notice. For Kamal Elsadig and many other Sudanese entities, who have opposed the Sudanese ruler Omar Al Bashir and were kicked out of the satellite program, it is clear: there was a cooperation between the Sudanese and Egyptian intelligence services, and as a result, the viewers in Darfur got no information what was happening around them. Today Dabanga TV is using the European satellite provider Eutelsat, where they feel safe from attacks from Khartoum. 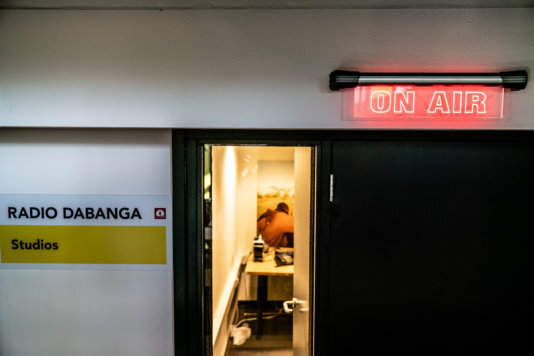 Nevertheless, the future of Radio Dabanga is far from certain, as the station relies on funding from various donors including the European Union. But European governments and the Sudanese authorities are now working hand-in-hand to fight terrorism and to stop migration through Sudan, which provides for one of the major migration routes through East Africa. And appeasing Al Bashir and his regime might affect the station's funding severely. Difficult times for free press ahead in Africa, but also, perhaps even inside the European Union. They get their information from the local people. Eyewitness reports you won't find elsewhere in the country's media, but which are crucial for the safety of the people on the ground. Independent reporting is not taking place in Sudan anymore, and all press activities are monitored and potentially censored by the government. In addition, there are hardly any reports in the international media about the Darfur conflict anymore.